About 1.5 miles southeast of Rachel a dirt road intersects with the Highway, leading roughly west. 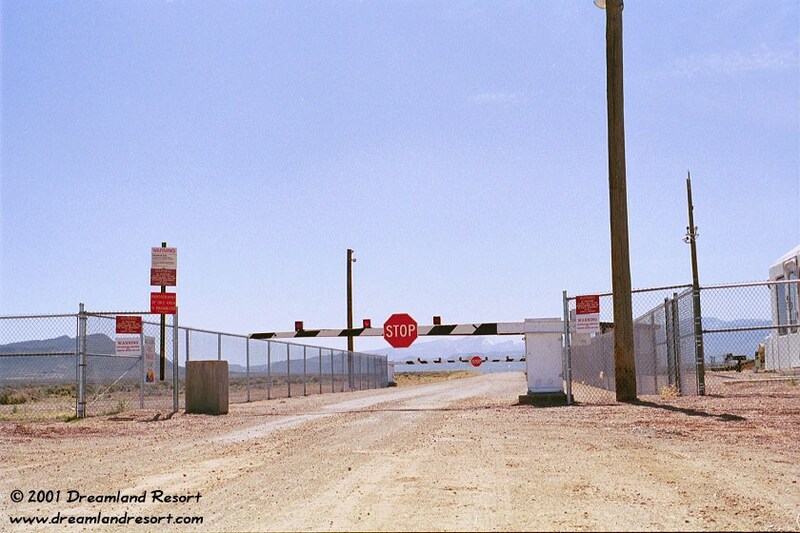 If you follow that road for a good 10 miles, you get to the North Gate of Area 51, also known as the Rachel Back Gate. 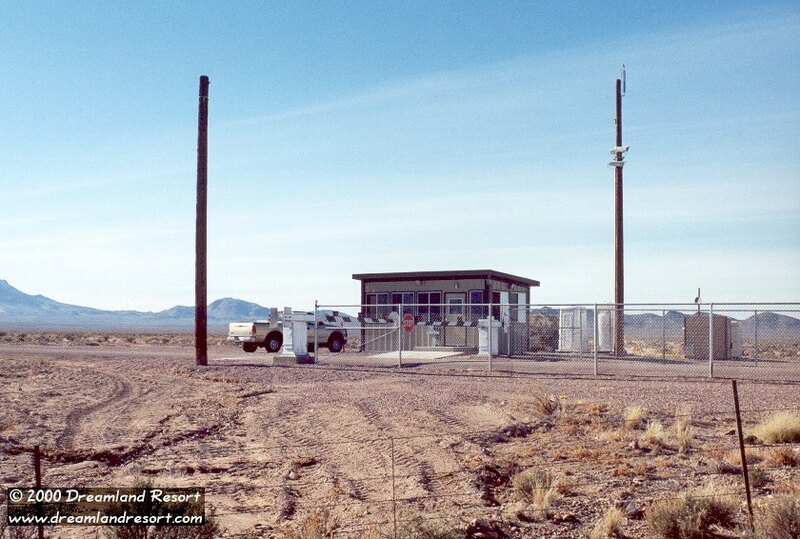 Unlike the Groom Lake Road border, here you get to see a real guard shack, a gate and a fence marking the perimeter. There is actually an old fence a few hundred yards before the boundary, but it is ok to pass it and drive right up to the black and white gate. WARNING: A similar setup can be found at Cedar Gate, a little further north. There, however, it is NOT OK to drive past the first fence. 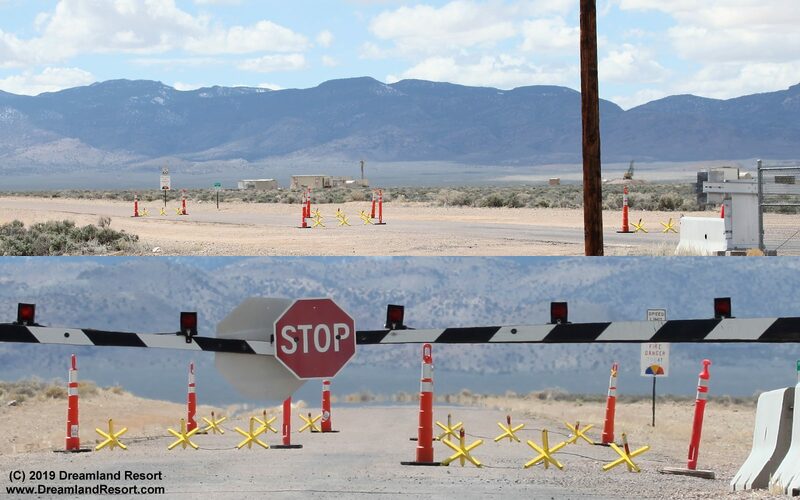 There are several small buildings, warning signs similar to the ones on Groom Lake Road, and a double gate with a chain link fence marking the border. Usually at least one guard is inside the guard shack, and a security vehicle is parked behind the building. 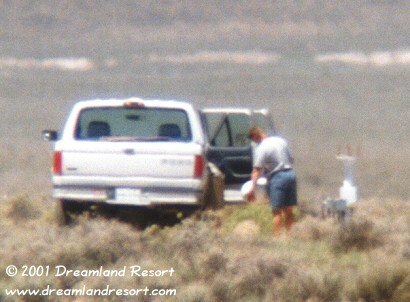 The ground is level here for several miles, so there is no need for patrol cars sitting on a lookout hill like by Groom Lake Road. 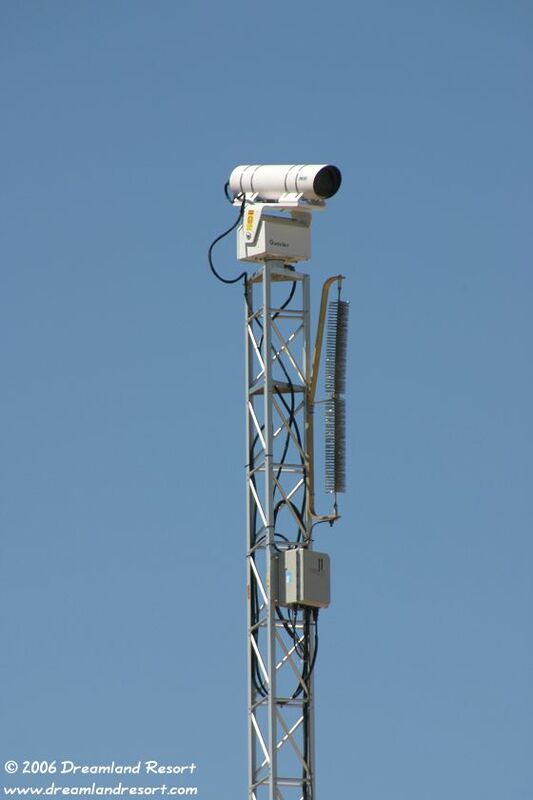 However, there are several tall poles with with floodlights and various cameras around the guard shack. The cameras can be monitored from inside the guard shack, as well as from a central security station in a different location. Life as a cammo at the Back Gate is good. There is a barbecue behind the building, and a large satellite dish next to it. On several occasions we caught the guard watching TV (they seem to like old Western movies). The only downside is having to use a port-a-potty when nature calls. There is no septic system or running water, and power is provided by a generator inside one of the buildings. In October 2000 the Gate was upgraded to new security standards. A new Guard Shack, about 30 yards behind the old white Guard Shack, was added. 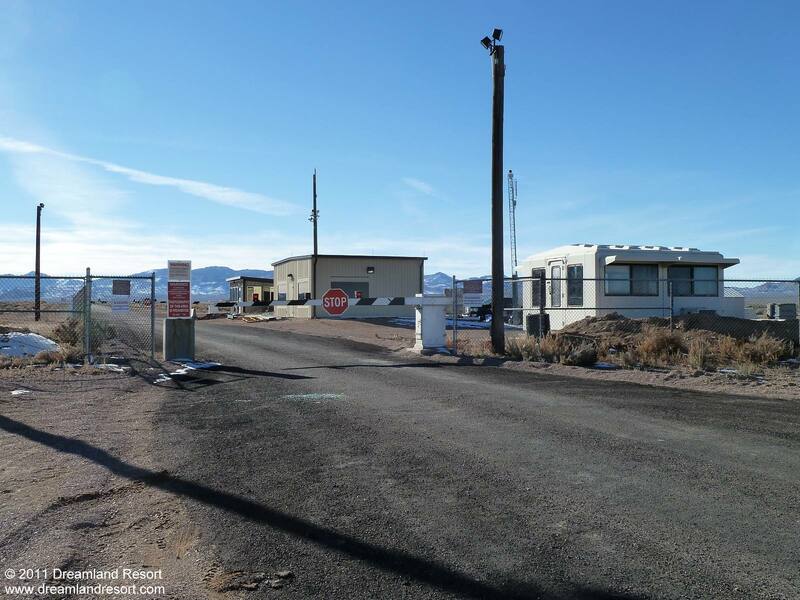 A new fence was set up and the old barrier was replaced by a black-and-white double gate with red lights, similar to the one at the hidden guard shack on Groom Lake Road. The area between the gates is enclosed by a chain-link fence. Apparently the idea is to have a lock gate for increased security. When a vehicle checks in, they are boxed in between the gates while the guard checks their paperwork. This way they are no longer directly exposed to public view during check-in, and also a potential intruder would be "trapped" between the gates. The three main buildings have black building numbers: 997, 998 and 999. The old white Guard Shack is still there, but it looks completely abandoned and does not have a number. There are several Russian radar sites and various support buildings northwest of the guardhouse, about 1-2 miles inside the perimeter. See the link below for more information. One of the buildings near the radar sites has the building number 980, and likely the other buildings in that vicinity also have numbers in the high 900's that are not visible from outside the perimeter. It is interesting to note that the road leading to the gate from Highway 375 is a dirt road. 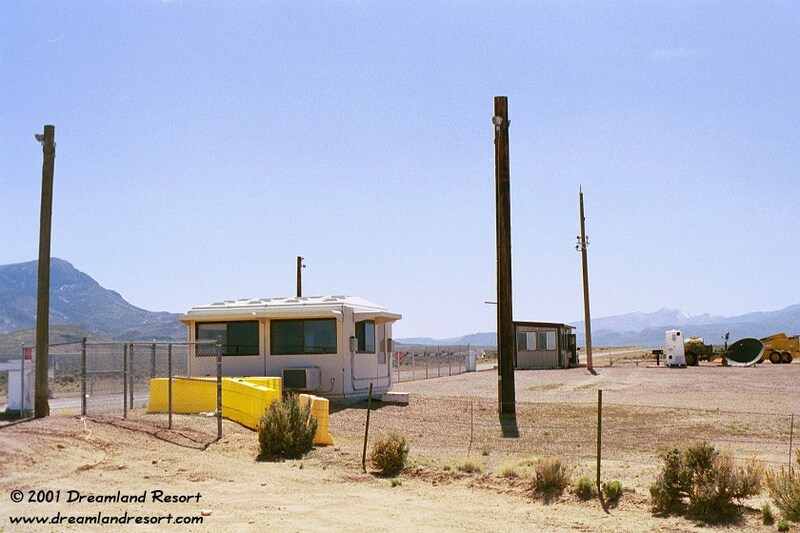 However, from the Gurad Shack on into Area 51 it is paved. Update 8/21/2010: The Area 51 Back Gate Road has been partially paved. The pavement extends for 2.2 miles from the Guard Shack to the intersection with a road leading north and eventually back to Hwy 375. The pavement continues up that road for another 0.8 miles and then ends. There is no indication for plans to extend the pavement past that point. 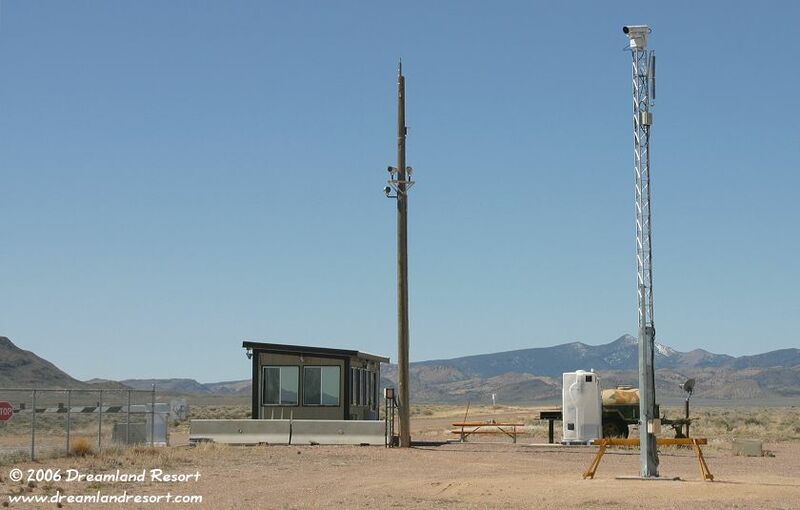 Update 1/07/2011: A large new Guard Shack is currently being built at the Rachel Back Gate to Area 51. The building is about five times the size of the current guard shack, which was built in October 2000. It is located between the current guard shack and the original pre-2000 guard shack. After the paving of part of the Back Gate road last August (see below), this is the second major upgrade to the Back Gate in six months. Update 04/02/2019: In late March or early April of 2019 the road just inside the backgate was secured with several rows of hedgehog-style barriers. Scroll down or click here for photos. In late March of 2019 the road just inside the back gate was secured against intruders with removable hedgehog-style barriers. Photo taken 04/02/2019. The new North Gate in April 2001. Notice the new chain-link fence with double gates and the new poles with more lights and cameras. 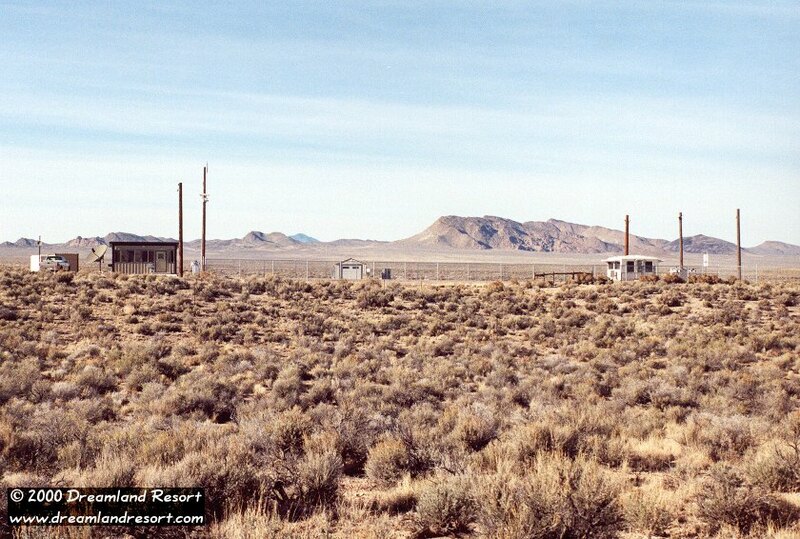 The old abandoned Guard Shack is visible in the foreground, and behind it the new Guard Shack. The area between the two gates is the new security zone for checking in vehicles. Photos by Andre Dall'au. This shot from the south shows the new security zone between the gates. 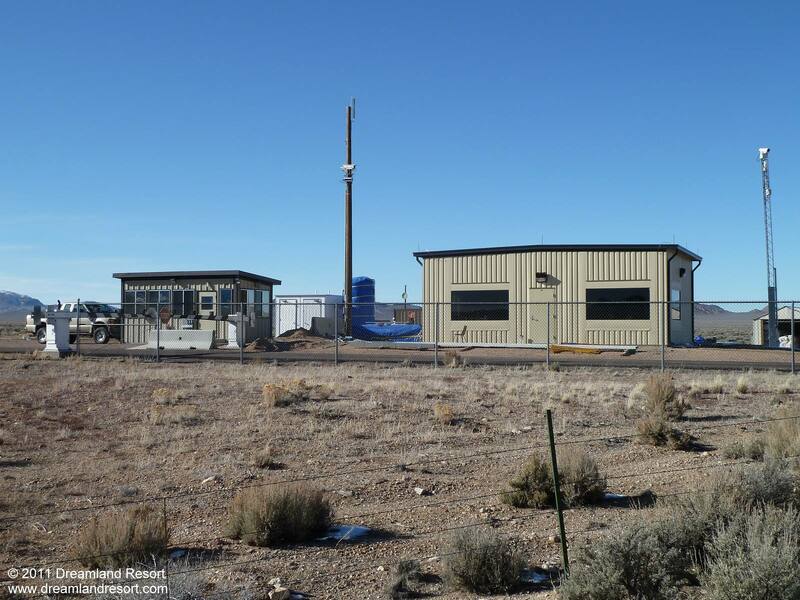 The new Guard Shack (building 999) is on the left, and the abandoned old shack on the right. A new chain-link fence and two gates frame the road between them. Both gates are operated from controls outside the new shack, visible in this photo as a gray box to the left of the door. The garage-type building between the two guard shacks is building 997. Several good-sized electrical cables can be seen leading inside, and it probably houses the generator that provides power for the Guard Shack. 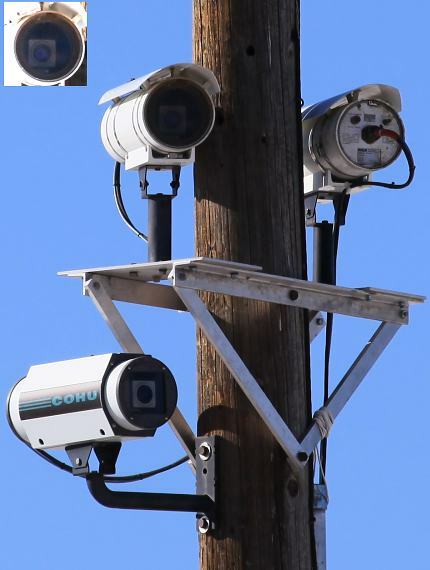 Also visible are the poles that carry flood lights and various security cameras pointed in different directions. A close-up of the new Guard Shack. It looks like a standard sheet metal structure, about the same size as the old shack. Judging from the white portable toilets outside it still does not feature a bathroom. The formerly clear windows have been tinted, but sometimes you can see a person move inside. A security vehicle is usually parked behind it. The pole with the cameras and the antenna is clearly visible. 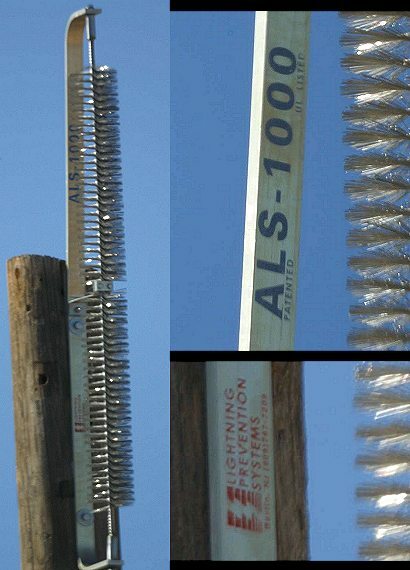 On its top is a lightning conductor. The small dish on the shed to the right (building 998) points to the relay station on Bald Mountain. You think you can sneak in? Think again... Big brother is watching. 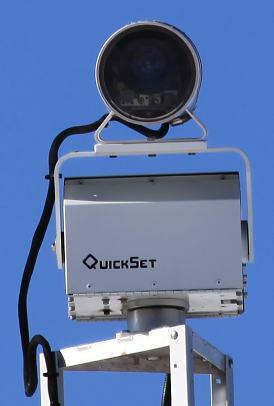 The image in the upper left corner has been enhanced to show the actual camera inside the housing. 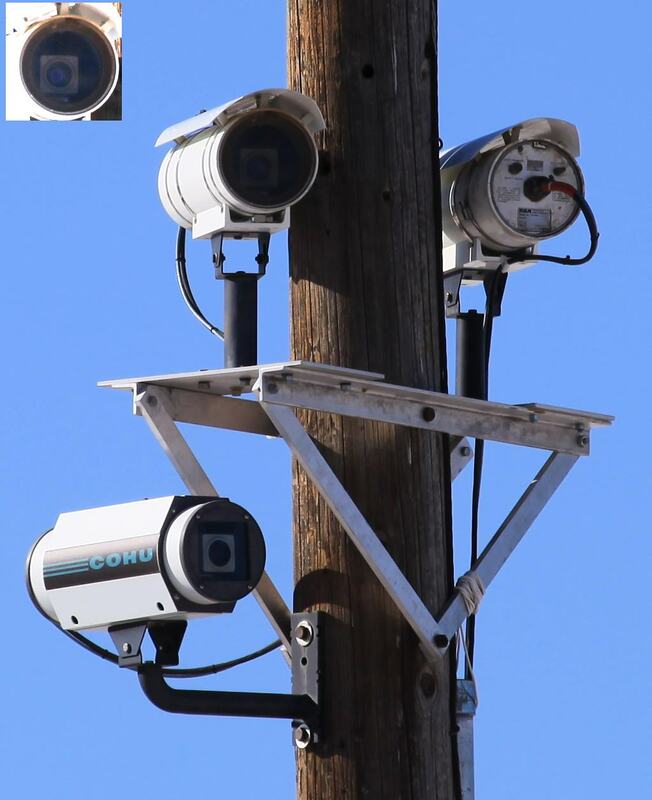 This "bore brush" at the top of the camera pole is an ALS-1000 lightning conductor, manufacturerd by "Lightning Prevention Systems". Photo by Chuck Clark. The object on the left is sitting a few hundred yards northwest of the guard shack inside the perimeter. It was set up here on 7/21/1999. The photo above shows a contractor setting it up. 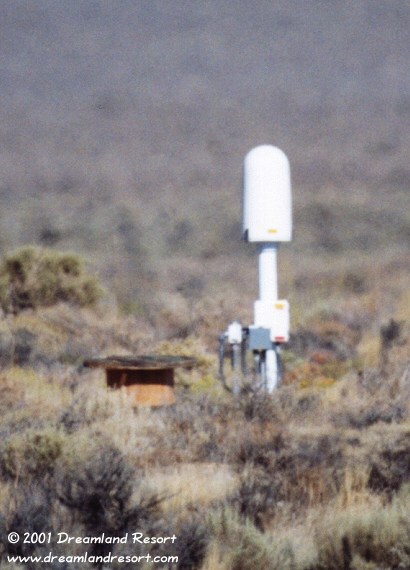 A similar device can be seen only a few feet inside the north fence of Nellis AFB, at the north end of the runways.